Arkansas is the first state in the U.S. where diamonds were found naturally (near Murfreesboro, Arkansas). The eastern border of most of Arkansas is the Mississippi River, except in Clay and Greene counties where the St. Francis River forms the western boundary of the Missouri Bootheel. Arkansas shares its southern border with Louisiana, its northern border with Missouri, its eastern border with Tennessee and Mississippi, and its western border with Texas and Oklahoma. 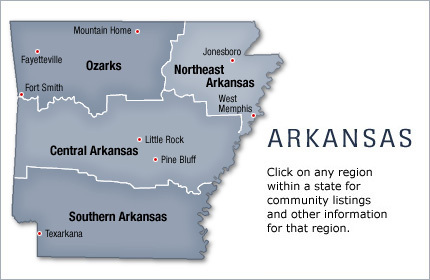 Arkansas is a land of mountains and valleys, thick forests and fertile plains. Northwest Arkansas is part of the Ozark Plateau including the Boston Mountains, to the south are the Ouachita Mountains and these regions are divided by the Arkansas River; the southern and eastern parts of Arkansas are called the Lowlands. The so-called Lowlands are better known as the Delta and the Grand Prairie. The land along the Mississippi River is referred to as the “Delta” of Arkansas. It gets this name from the formation of its rich alluvial soils formed from the flooding of the mighty Mississippi. The Grand Prairie is slightly away from the Mississippi River in the southeast portion of the state and consists of a more undulating landscape. Both are fertile agricultural areas and home to much of the crop agriculture in the state. The Delta region is bisected by an unusual geological formation known as Crowley’s Ridge. A narrow band of rolling hills, Crowley’s Ridge rises from 250 to 500 feet above the surrounding alluvial plain. Buffalo National River, one of many attractions that give the state’s nickname The Natural State. Arkansas is home to many caves, such as Blanchard Springs Caverns.